Celebrating Diane's 50th Birthday on the World's Biggest Cruise Ship! Oasis of the Seas in St. Thomas, USVI at her own special port! Oasis of the Seas is the first of two ships in the Oasis class (Internally referred to as the "Genesis Class" during her designing stages. Sharp eyed guests will notice a bit of insider humor if they look up on one of the walls of the Royal Promenade where a "painter" is scraping off the Genesis name!). She was inaugurated in December of 2009 and her sister, the Allure of the Seas, will debut in December of 2010. The Oasis has the distinct honor of being the biggest cruise ship in the World (by far... nothing else comes close)... and she should hold that title for some time to come! Gargantuan size isn't Oasis' only claim to fame... in the eyes of this cruise ship reviewer, this is the most beautiful, awesome, breath-taking, incredible and magnificent cruise ship ever built. In fact, I would go further and say that she's the first real "Cruising City" ever built! (when was the last time you cruised on a ship with a "Central Park"?) This is a ship that's so enormous, most of her island port-o-calls had to build new facilities, or find new locations for her to dock! On our itinerary, only Nassau in the Bahamas had the space (barely) for her using their old docking facility. You have to get far away to get a good picture of Oasis! Oasis docked in St. Thomas. Her lower hull is a powder blue from the keel (or at least the waterline!) up to deck 6 and from there up she's a brilliant white! This is a departure from the other ships having hulls that are all white. Also, her glass is all clear (affording better views of the ocean from the balcony) rather than the typical Royal Caribbean blue-green tinted glass of the older ships of the line. The first thing you notice, once you get over the sheer bulk of her size, is that the aft section is open! You are looking at the Aqua Theater and the Boardwalk. Never before has the aft section of a cruise ship looked as if a section has been carved away. It's staggering to see. Aft view of Oasis looking at the Aqua Theater and the vast opening of the Boardwalk section! She dominates every port she's in... she's truly an Oasis of the Seas. Chances are, if you were on this cruise with us and you found yourself singing "Happy Birthday" to someone you didn't know, it was to Diane! Many of the places we went to aboard on March 20th and March 21st, a member of our group would start singing the song and everyone at that location just joined in. This happened at the Rising Tide Bar (talk about a captive audience!) at the behest of Gary; the Schooner Bar (with the piano singer starting it off at the request of my brother, Jimmy), in several packed elevators and finally in the main dining room on March 21st! We loved it when on one elevator everyone was still singing "Happy Birthday" after we got off! (hey, we'd reached our deck) Thank you to all of you who made Diane feel so super special on her big birthday! Presenting Oasis: Our last Royal Caribbean ship was the gorgeous Liberty of the Seas. This ship and her Freedom Class sisters were the last record holders on size weighing in at 160,000 tons each. The Oasis Class dwarfs these ships coming in at an astounding 220,000 tons! Including the Viking Crown Lounge and her loft suites, she towers up to deck 17! Our cabin was on deck 12, the highest cabin deck we ever stayed on... and there was still one more regular cabin deck (deck 14) above us. Of course, for those with the deepest pockets, there are the loft suites on deck 17! When looking from her pool deck on deck 15 or the upper level of deck 16, you looked down on the pool decks of cruise ships adjacent to her. ("Hello down there!" ... sorry Carnival Destiny!) Invariably, those on the adjacent ships were craning their necks up and looking at the Oasis "wall". Oasis has many of the things you've come to expect on Royal Caribbean ships, as well as some major and amazing brand new offerings. Those places you knew on the old ships are generally on Oasis... just usually larger and better placed in most cases! In many respects, there seemed to be (for the first time on a Royal Caribbean ship) some influences from Celebrity (Royal Caribbean's sister fleet) in the Oasis design, and especially with regards to Celebrity Solstice. I'll have more to say on that below. It's easy to think that on a ship as enormous as the Oasis of the Seas, it would be easy to get lost. But Royal Caribbean has gone out of their way to make sure that doesn't happen. On this ship, as on the others in the fleet, there are plenty of maps and cutaway view markers in ample locations. You always know, just from a quick glance, which way is forward and which way is aft. In addition, you are given a pocket map of the ship when you check in that gives you a good start. But on Oasis... they go one better than this! They have the "Finder" screens, which I like to call info screens as I feel this is more apt to their actual function. Scattered about the ship, the Finder screens are flat, touch-screen Samsung TVs (see photo at right) that can help you find your cabin, or a venue aboard in addition to so much more. In addition to giving you maps and directions, these screens can also tell you the current wait time for any of the ship's restaurants based on real-time scanning of traffic flows in and out of them! How fantastic is that when trying to budget your time on a cruise vacation?! They also show you the daily Cruise Compass with all its "what's happening now" information. That's incredible! A quick glance at the photo here of one of the screens will show you what I'm talking about as far as the details presented and the options available to the user. In the lower right hand corner of the screen, a tap on the wheel chair icon will help those in wheel chairs use this powerful tool by lowering all of the controls on the screen to wheelchair level. That's thoughtful design! This is truly an advanced ship on all levels! So, at a glance on one of these screens, you can quickly see where you are, the time, and the date! (easy to lose track of on a cruise!) You can see if it's worth the time to go to an alternative restaurant by how full it is in real time. You can see what's going on all over the ship with just a few quick taps on the screen. This is a feature that will be sorely missed on our next non-Oasis cruise! Innovative touches like these are often missed in cruise reviews, but I think this is one worth mentioning. Port Everglades... Oasis Check In. Ultra modern and smooth as silk. The Ship: Entering the Oasis Royal Promenade, you are struck by its immense width... from port to starboard, this ship is extra wide! Immediately, you know you've entered a whole new dimension in cruising! This Royal Promenade is actually lit from above by gigantic glass arches (one houses the Rising Tides Bar) with sunlight filtering in from the vast Central Park directly above the Royal Promenade. On the Royal Promenade, one will find all of the old Royal Caribbean favorites like Sorrento's Pizza, and the Cafe Promenade and in addition new places like the Cupcake Cupboard (their $2.50 cupcakes are muffin sized and are delicious! ), the Rising Tide Bar (an immense bar slash elevator that is uber cool! It takes you on leisurely rides from the Royal Promenade up to Central Park and back down again!) and some other spots to wet your whistle or shop. Guest Services is now located directly on the Royal Promenade. The Oasis Royal Promenade... your first views upon entering the ship on Embarkation Day! This Royal Promenade also features a "mezzanine level" on deck 6 which houses the venerable Schooner Bar with the Future Cruise Sales adjacent to it. There's also "Focus", the camera store and picture sales are located here. To find and purchase your pictures quickly, you can go to a number of kiosks and insert your Seapass card and your pictures pop up with an option to buy 8x10 prints. (For smaller sizes, you'll need to hunt the old way.) Also on the mezzanine level is the newly created Diamond Lounge. This is a beautiful location for Diamond and Diamond Plus members to have their own little getaway... unfortunately, it seems as if it's largely unstaffed and forgotten. We saw the Diamond Manager there one day, and he said all events for Diamond members would be held at certain times in the Blaze night club. This was disappointing as this Diamond Lounge location was supposed to be Royal Caribbean's way of making up for the removal of rights to the Concierge Lounge from Diamond members. Instead, this is just a gated and empty location with some nice views of the Royal Promenade. Aft on deck 6 is the incredible Boardwalk with its Merry Go Round and its awesome Aqua Theater. The Boardwalk truly has a carnival flavor! There are many fun spots here... and a nice lunch time restaurant called the Seafood Shack. Johnny Rockets is also located on the Boardwalk. (I've never been a fan of JR's, so I can't tell you how the food is at this one). These restaurants have an inexpensive cover charge which buys a pretty extensive lunch time meal. There's also an ice cream shop where you can buy some really wonderful waffle cones, and a donut shop that has free donuts. There's a nice candy shop featuring those "fill the plastic bag" and buy by the quarter pound candies (malted milk balls, chocolate covered peanuts or raisins, caramels, etc. All the things we liked as kids! Got to remember to ride the Merry Go Round next time! Looking forward from the Boardwalk to the towering windows of Dazzles! Also on deck 6 is the Vitality at Sea Spa. This is a gorgeous spa, but I found the workout facility to be strangely lacking and somewhat cramped in space compared to the treadmill/workout areas on the Voyager/Freedom class ships. Also, there was no Men's/Women's sauna and steam room. Instead, all they had to offer was their Day Spa with coed facilities for a charge. I chose not to use the workout facility at all during my week aboard. We both did have excellent massages at the spa: my wife chose the "hot rock" massage while I had the more traditional Swedish massage. While massages on cruise ships are expensive, we absolutely love them aboard ship. Up on deck 8 is the awesome and incomparable Central Park. This is truly a triumph in cruise ship design. Here, set amongst gardens and trees are some of Royal Caribbean's signature and brand new specialty restaurants. Open to the sky with walls of balconies rising up on both sides some 5 decks, Central Park truly delivers the illusion of being in some small town center. The restaurants have indoor and some outdoor tables. There's an art gallery called Art Actually and there's a Coach store (the only one at sea). We ate lunch one day at Giovanni's Table at one of the outdoor tables. The family style meal (read: enormous portions) was sumptuous and wonderful. The appetizers alone filled us up. All this for a mere $10/person! Walk ups are welcome for lunch, and we had no problem walking right up and sitting right down at noon on an at sea day. Giovanni's Table is not to be missed. Diane and I decided to have a date night, and we couldn't have chosen a more perfect spot than 150 Central Park. This venue features a "tasting menu" which consists of small plates of food of 6 or 7 courses which really fills you up, all prepared by a spectacular, young, award winning gourmet chef. Between each plate, we "cleansed the palate" with a wonderful martini concoction. This amazing meal would set you back several hundred dollars on the mainland; here it was a mere $35/person. This is well worth the cost for a romantic night out on the town! Sit in the clam-shell chairs for the fun of it and near total privacy! Also located at Central Park is a fleet favorite, Chops Grille. Since we've eaten in these on other Royal Caribbean ships, we skipped it this time around, but these usually feature the best steaks and filet mignons to be found anywhere. They are always worth the cover. There was also a free restaurant located on Central Park called the Park Cafe. We stopped in for a look and the food looked very good here. We had plans to stop back during the week, but we never made it. We also forgot to go to Vintages for some wine (I like wine, but Diane doesn't). This is a repeating pattern on the enormous Oasis of the Seas; there's so much to do and so little time to do it in! Vintages... for some fine wine! Check out the enormous bottle under the table!!! The Dining Experiences: There are so many places to eat on Oasis, and all of them are magnificent. On most cruises, you're going to head for the buffet for your first meal, but on Oasis, there were plenty of alternatives... even on the first day at embarkation! Still, it's tradition for us to head to the buffet, and that's where we had our first meal, at the Windjammer Marketplace. The Windjammer Marketplace (deck 16) uses food stations (as we experienced on Celebrity Solstice) that makes the flow of traffic in the place much easier to deal with. The food here was consistently very good as was the service. The views at the aft windows looking down to the boardwalk are magnificent. It really hammers home that you are on an immense ship when you eat your first meal here. Opus Dining Room (decks 3, 4 and 5), Oasis' main dining room, was on three levels, and all three levels run as separate entities. There was no sweeping staircase leading from one level to the next inside the main dining room. A giant space oriented mural adorns one wall between the levels, and each level had beautiful artwork. There's also a major chandelier at the center of the room. Food here was very good to excellent. Our waiter, Igor, did a great job getting our orders to us in a timely fashion, but I found him to be less personable than most of the waiters we've had over the years. Our assistant waiter, Dexter, was excellent. Our head waiter arranged for the waiters to drop by and sing "Happy Birthday" to Diane on March 21st, which marked her 50th birthday! The Oasis menu was very good, and any seasoned Royal Caribbean cruiser will feel right at home here. Typical Delicious Dinner, Main Dining Room! 150 Central Park (Central Park) is the defacto not-to-be-missed specialty restaurant aboard. This is a tasting menu restaurant where the magnificent, award winning Chef Keriann Von Raesfeld prepares a feast of mini-delicacies. Yes, it's definitely worth the price, and yes, you will leave full! There's a wine pairing for an additional fee if you are so inclined! The ambience is relaxed and wonderful, and the courses are amazing. Don't miss 150 Central Park! Giovanni's Table (Central Park) is most reminiscent of the line's Portofino specialty restaurants on the other ships in the fleet, but with its own flavor! For a fee of $10 (lunch) each, we feasted on family style portions of incredible Italian food. We did this at lunch on the second day at sea... we walked up at noon and sat right down at the table of our choice outside under an umbrella. With the sounds of birds piped in, and the sunshine beaming down from over head and sitting amongst the gardens of Central Park, you lose track of the fact that you are out in the middle of the sea! Food here seemed never ending with each delicious course... truly, we were full long before the main courses came! ...but we preferred dining outside (second table in)! Lovely place for lunch! Solarium Bistro (deck 15) is located in the adults-only Solarium all the way forward. This bistro serves breakfast and lunch free of charge, and becomes a specialty restaurant for dinner. The offerings here are for the health-conscious, but the food is actually very good none-the-less! We had lunch here on our first day at sea. Seafood Shack (Boardwalk) is another entry fee place situated directly across from the line's ubiquitous Johnny Rockets burger and shake location. We've eaten at enough JR's on Royal Caribbean ships, and while I like their fries, and onion rings and malted shakes, I'm not that crazy about their burgers. So, we were glad that Seafood Shack offered an alternative venue to the JR spot. We thoroughly enjoyed our lunch at the Seafood Shack which had plenty of seating available when we ate there. The food was terrific and again, there was lots of it! Don't miss the Seafood Shack. Sorrento's and Cafe Promenade (Royal Promenade) are both just as wonderful as they are on other ships of the line. We always love these for the pizza and croissant sandwiches that they offer. The desserts here are delicious, too. As I said at the start of this section, Oasis of the Seas has a tremendous list of places to eat and savor and enjoy for breakfast, lunch, dinner or just snacks. One week is not enough to get to all of them. For instance, on my next Oasis (or Allure) cruise, I hope to eat at Chops Grill (our favorite on other ships) and Izumi (Asian cuisine) and Park Cafe (Central Park's free restaurant). We also missed out on a night at Vintages. We did indulge ourselves at the Cupcake Cupboard (Royal Promenade) and the Ice Cream Parlor (Boardwalk) and we highly recommend both! The Candy Store (Boardwalk) also has candy for sale that offers a dose of nostalgia, as well! The Oasis Nightclubs and Bars and Casino: All of the ship's bars and night clubs are spectacular, but two stand out: Dazzles and The Rising Tide Bar! The Rising Tide Bar (floating from the Royal Promenade to Central Park and back) is the Oasis' most talked about bar, and with good reason... it levitates! You can board it in Central Park or on the Royal Promenade and enjoy its very leisurely trip up or down while having a drink. I never timed it, but I'm guessing the ride up (or down) is ten minutes long? We were able to board this bar easily enough and it was never over crowded, nor were there any lines to deal with (as I imagined there would be before we boarded Oasis). This is a truly spectacular bar... we love it. Diane was treated to all of the patrons there singing "Happy Birthday" to her! Wow! An elevator with seating that serves drinks! The Rising Tide Bar! Dazzles (decks 8 and 9) is the best dance location aboard! It features a lit dance floor, live music which switches to DJ music later with different flavors of music on each night. It also has an excellent bar, and an upper level overlooking the action. But the biggest attention getter is its magnificent floor to ceiling window looking aft to the Boardwalk. Incredible! We had our best partying here! Line Dancing in Dazzles! Note the lit up dance floor! Dazzles, looking aft at the incredible Boardwalk and Aquatheater! Blaze (deck 4) is the ship's other disco. This dark and seductive club has a nice little dance floor and a tremendous bar... but the DJ here played terrible music (in the opinion of all age groups) as witnessed by the fact that no one was dancing. Fortunately, the week's "guest" DJ saved the night one night and played a good selection of modern dance hits. Why the normal Oasis DJ didn't see the difference and adapt is beyond me. I hate when a DJ thinks it's his/her job to entertain themselves rather than fill the dance floor and the club! Viking Crown Lounge (deck 17) features a gorgeous forward looking bar at the top of the ship and lights that look like gobs of honey pouring out of the ceiling. The views here are breath-taking. I wish we had spent more time here, but time is of the essence when you're on a 7 night cruise. The gorgeous Viking Crown Lounge! Schooner Bar (deck 6) located in the Royal Promenade's "mezzanine" level and overlooking the spectacular scenes there, while still capturing the privacy of the fleet's other Schooner Bars. There was an excellent piano player/singer there who treated Diane along with all of the patrons there to another rendition of "Happy Birthday". Drinks here were, as always, spectacular. Most of the Schooner Bar and its piano area are behind the view below... I just love this overlook of the Royal Promenade! Schooner Bar... awesome location... awesome bar! The Oasis Pools and Solarium: there are a lot of places to swim or just sit in and relax on Oasis of the Seas. Our favorite spots were the Solarium and the Beach Pool. The Solarium is the adults only (ages 16 and above) location aboard Oasis. This is truly the most spectacular Solarium of any we've ever seen on a cruise ship! Its location at the front of the ship only adds to the incredible beauty. While reserved for adults (there are signs clearly stating this), many parents flaunted the rules and brought their kids into the Solarium anyway. This is both rude and unfortunate, considering that 95% of the ship is open to children, and some locations could be designated as "kids only" aboard Oasis. There weren't many kids there thanks to the Solarium staff asking them politely to depart... but there's also no reason for them to be there in the first place. Oasis has many children's programs to keep them occupied while their parents enjoy their time in the Solarium... without the kids. Come on, parents: let the Solarium be what it is supposed to be... an Oasis for Adults. The Solarium straddles the entire front top deck of the Oasis with commanding views forward of the ocean. It has two levels, two hot tubs and one round pool at center. There are also many of the clam shell beds (see their white tops in the picture) similar to the ones we loved on the Celebrity Solstice in its Solarium (again, a touch of Celebrity on Oasis!). The Solarium has a bistro here with healthy food selections. There's a little water stream that surrounds a nice shaded section filled with cushioned couches and chairs so that those who avoid the Sun can enjoy a spot in the Solarium as well. Nice touch! The Solarium converted to a night club one night (the disco, Blaze, was turned over to the teen crowd). This was an excellent location for a party! All of the big round upper deck chair areas became dance floors. Brilliant! The pool areas are huge... there's actually five main pools and a plethora of hot tubs. The Aqua theater pool is one (apparently you can swim there, but we never did) down on deck 6. Going forward and up to deck 15, you encounter the Sports Pool and the H2O zone (the children's splash and fun area) and further forward still, the Main Pool and the Beach Pool. We spent the bulk of our time in either the Solarium or the Beach Pool, although we made it a point to hit all of the other pools and hot tubs at least once. Of course, there was the wonderful bar service and roving drinks servers and the wonderful steel drum Caribbean music! There are two cantilevered hot tubs, one port and one starboard, just like on the Freedom class. Unlike the Freedom class though, these hot tubs are much larger and are actually split into two hot tubs... so it could be said that Oasis has four cantilevered hot tubs. Each has some flat screen TVs showing sports events on them. Although close to the Solarium, these hot tubs are not part of the Solarium (as they are on Freedom class ships) and are therefore open to all ages to use. As on other Royal Caribbean ships, there's always at least one pool and a hot tub or two open 24 hours for use. I love this! It's a great way to end a night of partying! Well, of course, there are many things unique to Oasis. The Zipline comes to mind. Getting reservations was tough (everyone wants to do this!) but we found out that the last day in port at Nassau, they were holding "open" zipping from noon to 2pm, so we zipped on up there by noon and stood in line for about 30 minutes and zipped across! I've ziplined in the forest canopy of Jamaica and over the ocean at Labadee, Haiti, so this was easy and just sheer fun for me. For Diane, it was her first zipline experience, and although she was terrified (you couldn't tell) she pulled it off gallantly! The ride, 83 feet over the Boardwalk, takes about 6 seconds to cross. Check to see when they have an open ziplining session on your cruise... from 1pm to 2pm, you could literally walk right up and go across. Another brave thing to try is testing your waistline! This is put to the challenge all over the ship all week long (and if a smaller waistline is your goal, you are probably going to lose!) but one of the most challenging local yummy places to put this to the test is the Cupcake Cupboard! For a small charge ($3), you get a muffin size freshly baked cupcake heaped with icing. They have the usual vanilla cake/chocolate icing, the chocolate cake/vanilla icing... oh and a plethora of others to try! They give you a spoon with which to eat them, and it's much easier to accomplish this with a spoon than a fork. We got two of these on the last night of the cruise and ate them on our balcony before disembarking the next day! My sweet tooth really wishes this venue was on all Royal Caribbean ships. The Cupcake Cupboard... ah, those incredible cupcakes! One unique thing on Oasis was the Globe on the Royal Promenade that opens up into a bridge/platform that the ship's dancers perform on during special events (like the Disco Party on the Royal Promenade). Don't have a good picture of the bridge opened up, but here is the Globe... keep an eye on it during your cruise! Yes, this Globe opens into a bridge stretching about halfway out over the Royal Promenade! The Oasis Cabin Experience: Our cabin, 12270, was a port side balcony cabin located right next to the aft elevator shaft. (there was no excessive noise at this location coming from the proximity to the elevators). The cabin is classified as a D3 "Superior Ocean View Stateroom with Balcony". It's the typical cruise ship "shoe-box" cabin. The size is rated as 182 sq ft for the cabin and 50 sq ft for the balcony. Interestingly, this cabin is actually smaller than the "E" class cabins on the Liberty of the Seas where the cabins are 200 sq ft with 53 sq ft balconies. Odd that the typical balcony cabins on the world's biggest cruise ship are smaller than those on her smaller sisters in the fleet. I still found the cabin to be roomy enough for the two of us. Although smaller than the similar class on Celebrity Solstice, the feel was more like a Solstice cabin than a Royal Caribbean cabin. The cabin doorways had their own little alcoves and the doors opened out into the hall, ala Solstice. The balcony furniture was also much more user friendly than that typically found on Royal Caribbean ships (you can actually eat at its table). The bathroom in the cabin, while still small, had some improvements... for instance, a leg rail in the shower, and a night light mode for the bathroom lights when the lights are turned off and a hidden trash can inside the cabinet. There were also more useful shelves in the bathroom for various items and a mini drawer. These were all features we first saw on Celebrity Solstice. Individual reading lights on both sides of the bed are a nice touch and there's also a master light switch beneath these on the head board. There's a nice comfortable couch and a 32" flat screen TV chock full of interactive entertainment and information and there's a stocked-for-fee fridge under a large dresser with a mirror. The art is pretty in the cabin and lit. There's a well placed full mirror right outside the bathroom. There isn't as much storage space in this cabin class as on other Royal Caribbean ships, but we managed to get all our stuff stowed away anyway. There was a decent supply of bathroom shampoos and conditioners and skin creams in the bathroom and they were nicely presented. Our cabin was kept spotless and wonderful by our wonderful cabin steward, Sharon from Jamaica. As you can see in the picture below, our travel agent had our cabin decked out in decorations for Diane's 50th birthday voyage... thanks, Karen!!! You are the greatest! (oh, and thanks again for the bottle of wine) Everything we ever ordered or requested was handled promptly and courteously... breakfast on the balcony? No problem. Tuxedo rental? Hanging in the closet when we arrived! Excursion tickets? There when we arrived. Perfect from beginning to end! Our Cabin, 12270, Decorated for Diane's Birthday in Bon Voyage streamers! Thanks, Karen! The Spa Experience: As I stated above, the massages that Diane and I had were excellent. Again, I found the workout and treadmill area to be small and cramped when compared to that offered on the Voyager/Freedom class ships... very curious this. I thought the biggest ship in the world would have matching facilities... at least as big as those on the Freedom class. I love a sauna and/or steamroom after a hard workout, but these don't exist as free spots on Oasis as they do on all the other Royal Caribbean ships. Instead, you must pay for this in the Vitality Spa Day Spa which is similar to Celebrity's Persian Gardens... but at $30/day I just wasn't interested. The Vitality Spa area is gorgeous though, and it has a healthy snack area right on premises. Opal Theater, home to Hairspray and Come Fly With Me! The next not-to-be missed show that's unique to Oasis is the diving and acrobatics show called Oasis of Dreams all the way aft in the awesome Aqua Theater! This show is simply mesmerizing from start to finish. What these performers accomplish is just magical. The Pool/Stage of the Aqua Theater, home to Oasis of Dreams! Also unique to Oasis is the Comedy Live theater and its Standup Comedy Show. This show consisted of two great comedians and an MC who left us in stitches. There was some incredibly accurate humor aimed at Carnival Cruise lines that almost had me on the floor. Again, don't miss this show! All the way back to Voyager of the Seas, all of RCI's larger cruise ships have had ice-skating shows. Oasis continues this tradition with the whimsical ice-show called Frozen in Time. This one is fun and cute, but I really can't stomach those routines where the guy is spinning a girl he's holding at her ankles and making her head come closer and closer to the ice. Does anyone really enjoy the thought of her skull impacting? I get enough kicks out of the leaps into the air. This is a great show though... and the artist who draws scenes with such rapidity that it looks like animation is awesome. Studio B Ice Skating Rink, home to Frozen in Time! Another show that had the audience out of their seats was Come Fly With Me. I always love the productions shows and this one is tops. Excellent singing, dancing... and yes, flying above the stage. Another one not to be missed! Our Itinerary: This was the typical eastern Caribbean itinerary: we traveled from Ft. Lauderdale's mega-cruise port, Port Everglades on Saturday, March 20th. Watching the behemoth ship that is Oasis pull out backwards in a port chock full of big cruise ships (but Oasis dwarfs all of them) and then executing a majestic twirl in port before going out to sea was amazing. Equally fun to watch were the Coast Guard ships streaming out ahead of us and warning small boats and yachts out of our way! Yes, we are enormous... and yes, this ship will crush you! The following two days, March 21st (Diane's big 50th birthday celebration!) and March 22nd were two lovely days at sea. Days at sea are always our favorites. March 23rd, we arrived at St. Thomas and we quickly hopped on an excursion that took us over to gorgeous St. John where we enjoyed the most beautiful beach in the world, Trunk Bay, for about 75 minutes before heading back to the Oasis. Trunk Bay, St. John, USVI... amazing beach! On March 24th, we arrived at St. Martin and we took a cab to the second best beach in the world, La Playa at Orient Bay! (Hello, Jerome!) We enjoyed another breath takingly gorgeous day at Orient Bay (even the bad days there are excellent). Later, Diane "found" her perfect tanzanite bauble for her birthday present. La Playa Beach at Orient Bay, St. Martin... it doesn't get much better than this! March 25th was another gorgeous day at sea. On March 26th, we arrived at our last stop on the last day of our incredible voyage... Nassau, Bahamas. It was an incredible sight to behold as our gargantuan ship slipped into its dock at the end of the pier. Diane got off to shop, and I got off just to snap a few quick pictures and then I got right back aboard to enjoy the ship! Our departure from Nassau featured another amazing feat of backing away in a very tight spot (it really looks like the bow is going to scrape the beach!) and doing a twirl to face forward and head out to sea. It almost looks like Oasis is showing off... and they make it look so easy! Truly, the itinerary is becoming less and less important to us anymore. Our preference is the eastern Caribbean for St. Thomas and St. Martin... but with a ship like Oasis, with all it has to offer, getting off the ship seems like you are missing out on something. Frankly, if the ship just pulled out of Port Everglades and dropped anchor 3 miles out to sea (so that the Casino and retail places could open up), I'd be more than satisfied. Who cares about going anywhere when you are on Oasis? Things Royal Caribbean should do to improve Oasis: Nothing major in my opinion... however, some in our group had problems. My brother got a very nasty cut on his big toe (almost needed stitches!) from a poorly designed chair in the Solarium. (an official there agreed that they would have to do something to remove this danger from those chairs. I never saw the chair that caused the problem, so I can't comment on what chair to avoid. If Jimmy has a picture, I'll upload it here.) My father had a hard time with the plugs being situated under the desk/dresser in the cabin (in fact, we all thought this was an odd setup) and my sister felt that the room safe was too low to the floor in the closet. (Again, officials on board stated that improvements to this were in the works... your comments DO count). Also, as I said above, the workout/exercise facility was the first I ever encountered that left me without a "Wow!" experience. My only real complaint has nothing to do with Oasis of the Seas. There's nothing that is a show-stopper for me. My problem is with the Crown & Anchor Society and how Royal Caribbean has chiseled away at some cherished things we always looked forward to... for instance, the Diamond Coupon book. What used to be a coupon book loaded with fun stuff for those "Loyal to Royal" has now become a pitiful ghost of its former self. The next big disappointment was the Diamond Lounge. This Diamond Lounge was Royal Caribbean's answer to their taking away a perk we used to enjoy: access to the Concierge Lounge. It took us a long time, and lots of dollars to achieve Diamond status, so we were very disappointed by the loss of the Concierge Lounge. The Diamond Lounge promised great things in the literature. Its gated, keyed-entry location overlooking the Royal Promenade looked so exciting on the first day... unfortunately, there was nothing special ever planned for this location as far as we could tell. All of the "exclusive" Diamond events were held in the Blaze night club. Even a sign stating that a special breakfast would be held in the Diamond Lounge was wrong. As far as I could tell, the Diamond Lounge was just a fancy place to sit... even though it looked like it was planned to be so much more. Finally, the welcome back party for Platinum, Diamond and Diamond Plus members was held in the illogical location of the ship's theater (no dancing here!) with pretty lousy hors devours and at 5pm while in port. The cruise director expressed surprise that only 1/10th of the ship's 1000+ P, D and D+ members showed up! Really? Geez. Interestingly enough, after writing this review, I found that there is a ground swell of reviews and blogs from others on the net also voicing their disapproval of the cuts to the Crown and Anchor Program. It's time for Royal Caribbean to listen up! Loyalty programs are very important in today's rough economy, and they should be the LAST place to make cuts to tight budgets. Why Oasis of the Seas should be your next cruise choice: Because it's a spectacular ship! There's so much to do and so very little time to do it all on a standard seven night cruise. So many bars and restaurants that we missed out on that we really wanted to try. We also missed out on getting around to riding the merry-go-round or playing miniature golf or climbing the rock wall... and once again, I missed out on the Flow Riders even though there's TWO to use! I didn't walk or jog the outside promenade nor did I get up to one of the railed areas above the Aqua theater that my brother in law raved about! One week just isn't enough... next time, it's a back to back two week cruise for us... even if we have to take an inside cabin to be able to afford it. There's just so much ship here... it's truly a City at Sea! I can't wait to get back to Oasis or perhaps her sister coming out in late 2010, the Allure of the Seas. Oasis of the Seas in her own special port in St. Martin! One Last Look: As we jetted out of Ft. Lauderdale, I made sure I was on the correct side of the plane to get a few shots of Oasis at her dock. 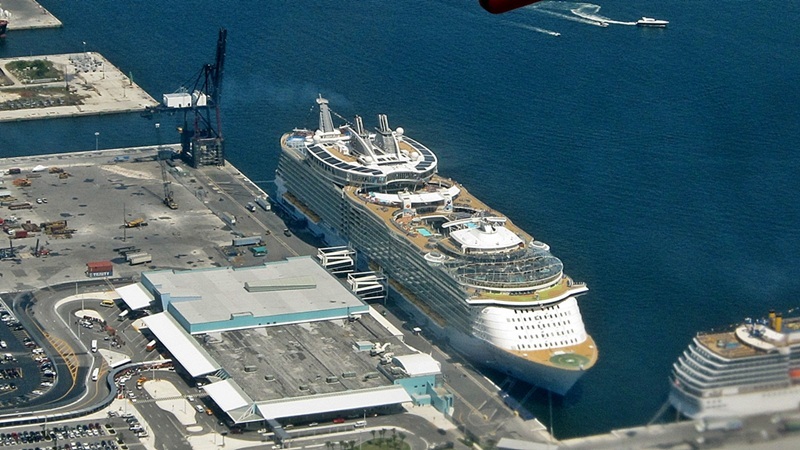 I based my assumptions about how to get this photo on our flight in from the previous week when we flew in over Port Everglades and saw Celebrity Equinox sitting at the same dock. I was lucky that the plane used the same departure path as the previous plane's arrival path. I only had a few seconds to snap off some shots as the planes go over Port Everglades during their climb. Oasis of the Seas was plainly visible from the ground at the Southwest Airlines gates concourse, so I had a pretty good idea that I'd be able to get the pictures from over the ship as we flew away from Ft. Lauderdale. Okay, finally, the perfect spot to get a great shot of the entire ship! This photo has been cropped and enhanced in PhotoScape to focus on Oasis and to overcome some smudges on the plane's window. Enjoy!